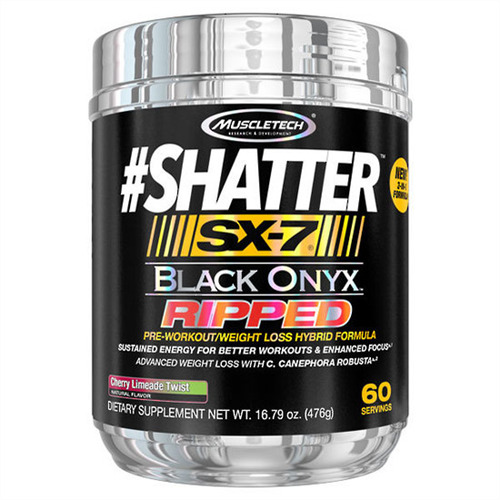 MuscleTech Shatter SX-7 Black Onyx Ripped is a new dual-function pre-workout and weight loss hybrid formula from MuscleTech. This unique formula combines precise doses of powerful pre-workout ingredients, such as beta-alanine, taurine and citrulline, plus a scientifically tested key weight loss driver backed by two human studies. MuscleTech Shatter SX-7 Black Onyx Ripped also features a one-of-a-kind mix of sensory ingredients, including Myristica fragrans, satsuma orange, Scutellaria and black currant powder for a truly unique experience unlike anything you've ever tried. Myristica is nutmeg (seed) that contains a premium compound called myristicin. Satsuma orange is an ancient Japanese citrus fruit containing the unique carotenoid compound beta-cryptoxanthin, and Scutellaria is an herb native to Asia that contains baicalin (a flavonoid). This unique combination of sensory ingredients isn't found in any other supplement and is unique to #Shatter SX-7 Black Onyx Ripped! An amino acid that is metabolized in the body into arginine and nitric oxide. L-carnitine is involved in energy metabolism – and SHATTER SX-7 BLACK ONYX RIPPED has 500mg of L-carnitine L-tartrate per scoop. Subjects taking 200mg of C. canephora robusta lost an average of 10.95 lbs. in 60 days with a low-calorie diet, and 3.7 lbs. in 8 weeks with a calorie-reduced diet and moderate exercise*. Each scoop of #Shatter SX-7 Black Onyx Ripped has 500mg taurine which is a free form amino acid commonly found in pre-workout formulas and energy drinks. A popular pre-workout ingredient that has been added in a precise dose 1,600 mg (1 scoop) for a truly complete formula. Shatter SX-7 Black Onyx Ripped features a powerful dose of this scientifically researched ingredient shown to enhance thermogenesis, increase energy and enhance mental focus. Mix 1 serving (1 scoop) with 6 oz. of cold water and consume 15-20 minutes before your 2 largest meals. For best results, use with a diet and exercise program. Do not snack between meals or before bed. Do not exceed 2 servings (2 scoops) in a 24-hour period. Mix 2 servings (2 scoops) with 12 oz. of cold water and consume 15-20 minutes before your workout. Do not exceed 2 servings (2 scoops) in a 24-hour period. *Do not take within 5 hours of bedtime. Read the entire label before use and follow directions provided.